The period from 1915 to 1930 was marked by several explosions connected with the Solvay Process Company and its Semet-Solvay division.There were other incidents — unfortunately, explosions and fires were all-too-frequent at chemical plants in the early 1900s — but spotlighted here are the most spectacular from this 16-year period. Five men were killed and five seriously injured at 8:45 o’clock last night, when a tank containing acid exploded in the benzol recovery plant of the Semet-Solvay Company at Split Rock. Three men were killed instantly, another died in an ambulance on the way to this city and the fifth at the Hospital of the Good Shepherd early this morning. At 3 o’clock this morning surgeons who were caring for the injured said that all would recover. The three-story building that housed the two acid tanks was wrecked. A burst of flame that followed the explosion blew out windows in adjoining buildings and threatened to destroy the huge plant that has sprung up at Split Rock in the past year. The shock of the blast was felt in several sections of Syracuse. A blinding snowstorm prevented aid from reaching those who were injured. Ambulances from the city carrying physicians were frequently stalled in snowdrifts, and it was not until early this morning that details of the accident were obtainable. A strong cordon of guards and special police surrounded the Split Rock plant. Reporters who succeeded in forcing a way through the snow-blocked roads were unable to pierce these lines until officials of the company issued general orders admitting them. Semet-Solvay officials made every effort to gather a concise report of the accident and learn the cause of the explosion. It was not until after midnight, however, that the first statements were received. The building in which the explosion occurred was built into a side hill and so constructed that in case of an explosion the brick work on the side walls would be thrown outward, leaving the framework and upper portions standing. The main floor is on a level with the ground on the upper side. This floor is about twenty feet above the floor of the story below, which opens on the lower ground level. Two tanks containing acid were on the lower floor, and it was one of these tanks that exploded. The building was constructed with an independent framework which supports the upper roof and floor. Between the upright timbers one course of brick was laid to keep out the weather, but in no way held up the structure. When the tank blew out, the walls were demolished, a great part of the machinery was wrecked, but only part of the structure was destroyed. Twelve workmen were in the building when the tank exploded. Those killed instantly were blown through the side walls. Others who were hurled several feet were buried beneath piles of bricks. The men who are injured were badly burned by the liberated acid and seriously affected by the heavy fumes. The terrific report caused a near panic in neighboring homes of employees and among workmen in other buildings. Flames leaped up as the echo of the report died, and for a few minutes it was feared the plant would be fire swept. Two lines of hose were played upon the flames by workmen and, because of the peculiar construction of the building, the fire was easily subdued. Heavy gas fumes filled the air, however, and workmen feared to go to the rescue of those who had been injured. It was nearly a quarter of an hour before the first body was pulled from beneath a heap of wreckage. Within the next few minutes the injured had been carried to a nearby lunch room and the other two bodies had been recovered. A general call for ambulances was sent to this city, but because of the drifting snow they were unable to reach Split Rock before 10 o’clock. Two of the dying men and three others were taken to Syracuse in the Hospital of the Good Shepherd ambulance. The Crouse-Irving ambulance took two more to the Hospital of the Good Shepherd. Harry Danser died just as the ambulance arrived at the hospital. William Curran died in the operating room a few hours after his arrival. Martin H. Knapp, assistant to the president of the Solvay Process Company, who gave out the first statement, said the explosion was caused by too much pressure applied to one of the tanks in the building. “The investigation has not been completed,” he said, “but it is apparent that no explosive material caused the accident. More probably too much of the liquid was forced into the tank and the explosion resulted." Workmen who were injured when the tank let go confirmed Mr. Knapp’s statement. Daniel Fitzgerald, who was not seriously injured, said it was not an explosion of the acid itself, but of the tank. Several other company officials were investigating last night and early this morning. Coroner S. Ellis Crane, who was notified of the accident before 10 o’clock, attempted to reach the scene immediately, but did not arrive at Split Rock until after 11:30 p.m.
At that time the bodies of the three workmen who were instantly killed in the explosion had not yet been removed to the county morgue in this city. That no outward influence had anything to do with the accident is manifest, according to workmen and company officials. Today, it was said, a technical explanation of the tank’s blowout will be given by the company’s experts. Among workmen, the building where the explosion occurred is known as TNT Plant No. 2. Fourteen men are employed at or near the two tanks in the building on each shift. Last night, however, only twelve men were at work when the acid tank exploded. Those nearest the tank had no time to escape or to make a move in self-protection. The acid blew out without warning, carrying the walls, machinery and men in its path before it. Those who were not fatally injured were near the other tank and not in the direct path of the blowout. These men inhaled poisonous gases, however, and received serious acid burns. Private touring cars and the horse-drawn ambulance of the Solvay Process Hospital aided in bringing the injured to this city. Workmen at the plant did heroic work in rescuing the injured after the flames had been put out and the fumes of gas had disappeared. Coroner Crane announced this morning that an inquest will be held, but the date has not been decided. Today he will take statements from the injured at the Hospital of the Good Shepherd and will continue his investigation at the scene of the explosion. The explosion did not interfere with the operation of the other Semet-Solvay plants at Split Rock. After the dead and injured had been removed, men resumed their work as if nothing had happened. The machinery of the benzol recovery building will be replaced immediately and the building reconstructed, so that there will be no hitch in the operation of the company, it was said last night. Frightened at the explosions that have occurred at the plants of the Semet-Solvay Company, the most disastrous of which came last night, when five men lost their lives and as many more were seriously injured in the benzol plant as the Split Rock branch, a number of employees today asked the paymaster for their money and turned in their resignations. The exact number who left the employ of the company this morning could not be learned, but that quite a number had turned in their time was acknowledged. Most of these were men employed in the same operation as were those who lost their lives or were injured last night. The blackened bodies of five young men are at the county morgue today. Five men lie in the hospitals or at their homes, burned and bruised as a result of the catastrophe. Lyman Green of 200 Cogswell Avenue, Solvay; William J. Guckert of 111 Hartson Street and Max Lepedus of 928-1/2 Grape Street, were killed instantly. William Curran of 334 Montgomery Street, died in the operating room of the Hospital of the Good Shepherd, and Harry Danser of Skaneateles died in the ambulance as he was being hurried to that institution. John McKeever of 235 West Washington Street; Daniel Fitzgerald of 425 Montgomery Street and John Masters are being attended at the Hospital of the Good Shepherd, while George Griswold of 914 Madison Street and John W. Osbeck of 614 Onondaga Avenue are under the care of physicians at their homes. Physicians in attendance at the Hospital of the Good Shepherd this afternoon reported McKeever’s condition was precarious. His body is badly burned, but if he can hang on to the slender thread of life for two days, the chances are that he will recover. Fitzgerald and Masters are in critical condition. the acid burned their faces and physicians say both are liable to lose their sight in both eyes. Fitzgerald also suffered a broken leg and broken arm. It was about 8:45 o’clock last night while the ten men with two others were engaged at their tasks in the picric acid plant known as T. M. T., No. 2, adjoining the one first built, that without warning there came a deafening explosion as one of the tanks burst. The five men working nearest it were blown through the walls of the building, three of them being killed instantly. Cause of the explosion, like others that have occurred at different plants of the Semet-Solvay Company, is said to have arisen from chemical causes. Despite threats made some time ago that the buildings might be blown up by some war sympathizer because of the fact that explosive are made there for use abroad, officials declare the explosion was purely an accident and did not result from outside causes. As the roar of the explosion rent the air and the bright flames shot into the heavens, workmen at the plant were paralyzed. Then came a rush to the scene and volunteers started the work of rescue. Every available ambulance in the city was called. Coroner Crane was notified and reached the scene at 11:30 p.m. after a hard trip behind the ambulance through the blinding blizzard. There are two tanks in the building and one of these, it is believed, had been filled to over-pressure, thus causing the explosion. It is not believed the accident was caused from a spark as has been the case in other similar explosions. Employees engaged in the adjoining plant who gave up their jobs today said the plant where the explosion occurred was an experimental station where attempts were being made to cut down the time of manufacture of the acid by a change of mixture. One of the men killed, Henry Danser, was in charge of these experiments and it is believed that the uncertainty of the practice was the immediate cause of the accident. Lyman Green, another of the victims, had just been transferred from plant No. 1 to plant No. 2 and had been at work but 15 minutes on his new job when he met his death. William Curran, who also was killed, said yesterday he intended to quit today. As a rule, fourteen men were employed in the building containing the two acid tanks. At the time the five men who were killed were working near the first tank. The five who were injured were further away, near the second tank. Two men were absent from duty, while the two who escaped injury were in a remote and protected part of the building. The exterior of the building today shows a large gape in the east wall, about 12 feet wide and 16 feet deep through which the men were hurled. Like other buildings of the Semet-Solvay Company used for the manufacture of benzol and acids, the one destroyed last night was constructed with the brick walls laid on the outer side of the steel framework so that in the case of explosion they would be hurled outward. As a result there was but little danger from fire following the accident and the small fires that resulted were easily subdued with water from two lines of hose. The interior of the plant, however, from what could be obtained this morning from a glance from the outside, was a mass of twisted ruins. Machinery, piping and other parts of the building were strewn about in a mass that told plainly the terrible force of the explosion. The vacuum caused by the sudden condensing of the air had caused the roof to buckle inward in several places. In the adjoining plant, not 25 feet distant from the wrecked building, men were working this morning. In this building there are eight big tanks similar to the one which exploded. However, it was said the work force there was seriously impaired because of the number of men who had quit their jobs. Those who showed up for work, while showing signs of nervousness, declared they have no intention of giving up such remunerative positions as they hold. With a good hourly wage and a monthly bonus, many of the men, mostly young fellows, are earning more than they ever did before. The blinding snowstorm that was raging at the time of the accident seriously hampered physicians and ambulances on their way to the rescue. Time and again they were held up by deep drifts and it was hours after the accident before they reached the scene. Work in other departments of the plant was not interfered with and after the dead and injured had been removed the men took up their occupations as though nothing out of the ordinary had happened. Company officials say they plan to re-erect the building at once. On July 13, 1916, in Haskell, New Jersey, three men were killed and 13 were injured in an explosion at the Dupont powder works. On the same day an ammonia tank used in a refrigerating plant at a Brooklyn butcher shop exploded, killed five persons and injured several more, including passengers in a passing trolley. Also on July 13, an explosion was reported at the Semet-Solvay plant in Tonawanda, New York, near Buffalo. Four workers were killed and several injured when part of the three-story facility collapsed. However, the cause of the damage was a lightning bolt that struck and destroyed a tall chimney. At least five persons were killed and ten were injured yesterday when an exploding ammonia tank used in a refrigerating plant ripped out the supports from a butcher store, at Sumner Avenue and Macon Street, causing the structure to leap one story into the air and then collapse like the proverbial house of cards. The explosion occurred at precisely eight minutes past ten in the morning, and was accompanied by a dull, thundering roar and a great cloud of lime dust, which settling revealed a huge mass of debris. On July 3, 1916, the Syracuse Herald reported the death of a former city fireman who had moved to Emporium, Pennsylvania, to work at the Aetna Powder Company. Edward J. Hoban was one of eleven workers killed in an explosion and fire at the plant on July 1. There was suspicion throughout the World War 1 years that such incidents could have been the work of German spies or people sympathetic to the German cause, but in almost every case the explosions resulted from worker carelessness or equipment failure or, simply, unforeseen chemical reaction. • 1915: It felt like an earthquake. 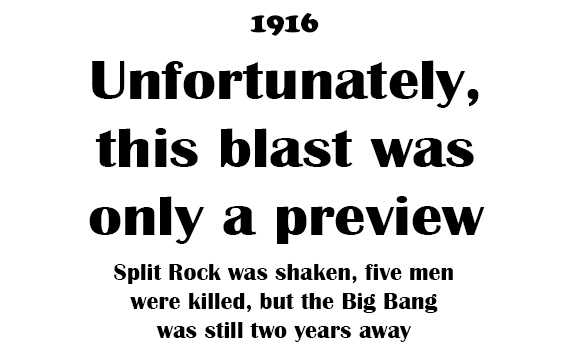 • 1918: Split Rock is ground zero.